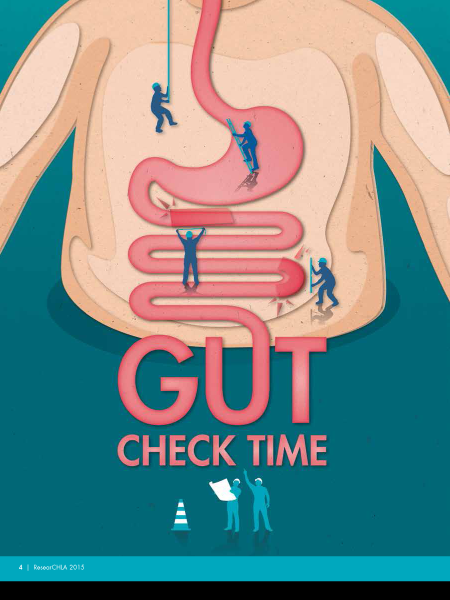 Children's Hospital/Gut Check — now has no boldface intro, so here it is —ResearCHLA is an award-winning publication highlighting a wide range of investigations at Children's Hospital Los Angeles, including into a rare and deadly pediatric gastrointestinal condition. This article received the top Gold Award for editorial writing from the Healthcare PR & Marketing Association. As a young surgical fellow at the University of Pittsburgh in the late 1980s, Henri Ford, MD, MHA, vowed he would try to unlock the mysteries of a terrible disease he saw all too often in the operating room—necrotizing enterocolitis, or NEC, which damages and even destroys the intestinal tissue of newborns. "Too many babies were dying. We just didn't have enough answers," recalls Ford, vice president and surgeon in chief at Children's Hospital Los Angeles. Now, thanks to a 360-degree offensive by multiple investigators at The Saban Research Institute of Children's Hospital Los Angeles, more clues are surfacing about some likely culprits for NEC, along with possible future intervention and prevention strategies. In addition to Ford, two of the leading investigators are also surgeons; like him, they have been inspired to look beyond their surgical training to biology. They are joined by basic researchers who are equally determined to defeat the most common and serious gastrointestinal disorder among newborns. This impressive brain trust is good news for families dealing with NEC, which most often targets preemies, whose organs are still developing at birth. About 30 percent of babies who develop NEC will die. Survivors face lifechanging consequences such as removal of part of their intestine—resulting in long-term dependence on intravenous nutrition and possible liver damage—or a bowel transplant. Either spells an uncertain future. "It's imperative we come up with a means of preventing this disease," says Ford, who is also vice dean of medical education and professor and vice chair for clinical affairs in the Department of Surgery at the Keck School of Medicine of USC. "If we can understand what pathogen or injury triggers the cascade of events that lead to the inflammation characterized by NEC, perhaps we can prevent it."